Click above to see much larger on our Flickr page. I took this photo Sunday afternoon from the Backbone Trail above the Pacific Palisades. In the foreground is Westwood and Century City — the telephoto lens smashes them together — and beyond is downtown Los Angeles. The many tall buildings along Wilshire Boulevard form a crescent shape across the left side of the image. The photo is not an all-encompassing view of the Los Angeles Basin. But it certainly shows a healthy slice of it. And it vividly makes the point that the extension of the Purple Line to the VA Hospital in Westwood will connect the Basin’s key activity centers — probably the most vertical parts of the Basin in terms of building size. Click on the photo to see a larger view. If you’re curious, here’s exactly where I took the photo. 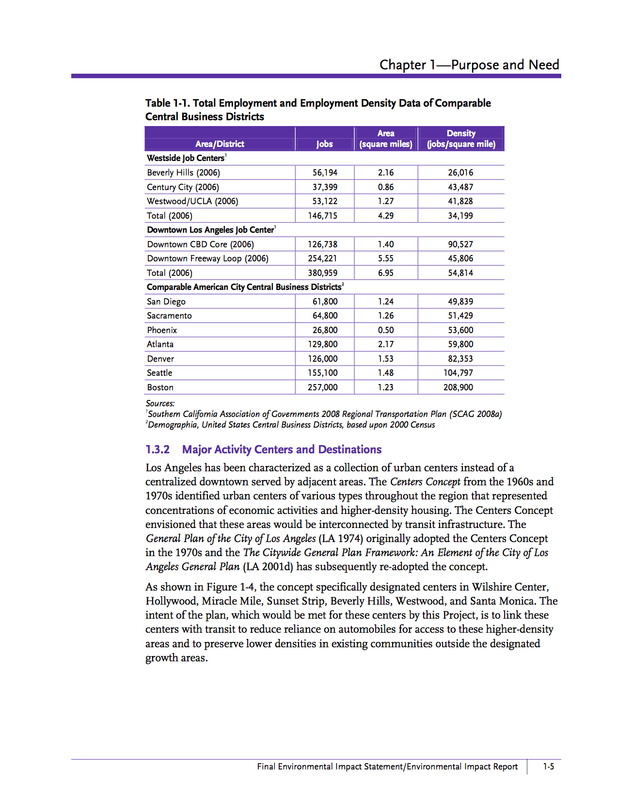 After the jump is a chart from the subway project’s final environmental study showing employment density in downtown L.A., Beverly Hills, Century City and Westwood compared to some other major American cities. Click above to see larger. Thanks for this post- it really puts how badly we need the Westside Subway Extension into perspective. I just wish this project could move to the front of the line. We all want Expo Phase II, the Foothill extension, the Downtown Regional Connector, and the Crenshaw Line/LAX Connector to be completed, but it seems nuts that we’re doing all those other projects first, and that the Westside Subway Extension won’t be completed until 2036. A picture that is truly worth 1000 words. I took this one a few years ago from an airplane. Looks like the right corridor to me! Doesn’t make sense that Metro would muck up this plan by routing it under a high school. Takes the the proverbial “shooting yourself in the foot” to a new level. The route chosen was selected for several reasons — it’s away from an active earthquake fault zone along Santa Monica Boulevard, it reaches a station in the heart of Century City and cost. Subways run under buildings, including schools, in the Los Angeles and around the world — despite what some people might say. Go to San Diego and ride on their light rail, which tunnels directly under the San Diego State campus.